RISING LIVING STANDARDS THROUGHOUT Asia mean more people are spending more money on life's little necessities. For regional investors, however, the flood tide of consumer goods washing into markets can be difficult to ride. Malaysia is a good example. A decade of steady 8% per-year economic growth has produced a consumer spending boom. But domestic manufacturers, distributors and retailers cashing in on the growth are as a rule small and privately held. Investors can't share their fortune. There is a way to play: buy shares of local newspapers and television stations. "Media stocks are one of the most direct ways of getting exposure to rising consumption in the region," says Kaushik Shridharani, a Salomon Brothers analyst in Hong Kong. Why? Because consumer product companies are prodigious advertisers. When business is good, newspaper publishers and television stations benefit as well. Media stocks in Malaysia have for several years offered investors consistent earnings growth at low risk, says Lai Tak Heong at SocGen-Crosby Securities in Kuala Lumpur. Although the country's newspapers are not adding readers quickly -- circulation is increasing at a rate of less than 5% a year -- advertising spending nationwide is growing 20% a year on average, says Lai. Profit margins are typically fat. Since 1995, major newspapers have increased their ad rates by 10% to 15% per year. The Malaysian publishing scene is diverse and rife with niche operators, with papers printed in Malay, Chinese and Tamil languages. Utusan Melayu Bhd., which puts out Malay daily Utusan Melayu, is a major publicly traded publisher. Nanyang Press Bhd., also listed, owns Chinese daily Nanyang Siang Pau. Stock in the publishers of the two largest English-language newspapers appear to be good buys right now, according to Lai. New Straits Times Press Bhd., owner of the New Straits Times, offers the security of a diversified revenue stream. The company also owns Berita Harian, the largest Malay daily, as well as a clutch of smaller newspapers and magazines. Star Publications' flagship, The Star, boasts a more affluent customer base and greater circulation -- about 210,000 readers to the New Straits Times' 180,000. Hudson Teh, research manager with Sarawak Securities in Kuala Lumpur, argues Star is the better managed of the pair. "Their circulation, ad rates, and advertising volume are all growing faster than the industry average," he says. 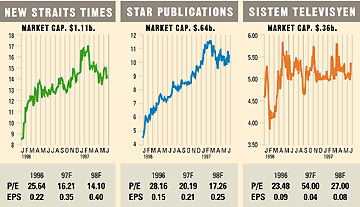 "Over a two-year period I see Star stock doing very well as their earnings grow strongly." A third paper, The Sun, adds to the competitive mix. But the privately held daily has less than half the circulation of its larger rivals and is considered the weakest of the lot. Indeed, Malaysian newspapers are somewhat shielded from new rivals. The government is stingy with licenses, and "it's very difficult for a newcomer to take on the established players," Lai says. A warning: newsprint prices, the bane of newspapers' bottom lines, could increase near year-end, analysts said. For those seeking more glitz and greater growth potential than print media, consider TV. In Malaysia, there's only one listed broadcaster: Sistem Televisyen Malaysia, known as TV3. Lai has a "trading buy" on TV3 because it is purchasing a 47% stake in New Straits Times Press from Malaysian Resources Corp. Bhd., which also owns a 40%-plus bloc of TV3 stock. The deal will diversify the broadcaster's income base, but buyers beware. TV3 stock is expensive, trading at about 20 times per-share earnings. Tough times may be ahead. There are two government-owned and two private stations, with a third possible next year. Also vying for viewers are two pay TV systems, a satellite network and a microwave network in which TV3 has a stake. "Competition will get intense over the next two or three years," Teh says. With so much uncertainty, conservative investors may be better off watching, not owning, the channel.